Overhead hoists make moving heavy items a whole lot easier. However, statistics show that almost 20 people died last year as a result of accidents with overhead hoists. Safety should be your top priority with any type of heavy machinery. It becomes especially crucial when working with overhead hoists. The items being moved tend to be fairly heavy, and they can cause serious damage if dropped. Want to be safer with your overhead hoist? Here are five tips to keep in mind. 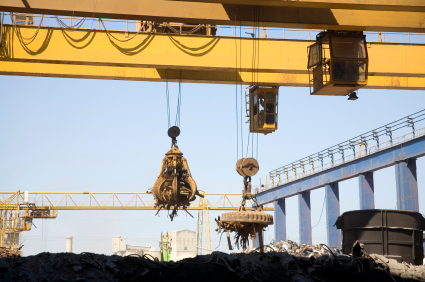 Regular maintenance of hoists is key to safety. Load testing maintenance will ensure that you know just how many pounds the hoist can handle, and will ensure that it stays in good condition. Maintenance is not something that should be treated as optional when it comes to heavy machinery. If any of the moving parts gives out, wears out, or breaks down, your hoist could cause serious damage. For the sake of your employees and the smooth operations of your warehouse or building, keep the hoist in good condition by ensuring it receives regular maintenance. One of the leading causes of accidents with overhead hoists is improper securing of the slings that carry the heavy objects. If the slings aren’t properly secured, the objects can slip out, tip until they are off balance, and eventually crash to the floor below. If the hoist uses a hook latch, make sure that it’s completely closed before you start moving the hoist. The attachments used for the hoist must be properly sized, and they must be sitting securely in the hook saddle before you move. If not, the attachments could become disconnected — with disastrous results! Overhead hoists must move the load straight into the air before shifting it in any lateral direction; that’s the only way to be sure that nothing is clinging to the underside of the load. If cables, boxes, or other objects become attached, they could add extra weight to the hoist. The load should always be lifted high enough that it will clear any obstructions. If it isn’t lifted high enough, it could knock over other objects and cause serious damage. Make sure the load will easily clear any obstructions before you move it laterally. When operating the hoist, any employees in the vicinity need to understand they are in a dangerous area. You should install “Hoist Danger” signs around the work area, to alert employees to the fact that a hoist is operating over their heads. Workers should always stay clear of the hoist, and they should never walk beneath any loads suspended in the air. Loads should never be moved over the heads of personnel, and personnel should never be lifted or transported on a hoist. The person responsible for managing the hoist needs to be extra careful with his or her actions as it’s in operation. The operator should never move too quickly, and should be careful not to jerk the hoist if it’s bearing a heavy load. Quick reversals of direction can cause heavy loads to spill, and swinging the load can be highly risky. Controllers should always have their attention completely focused on what they’re doing, and anything that takes their attention off the task is to be considered extremely dangerous. Operating an overhead hoist makes moving heavy loads easy, but it’s a dangerous job. Understanding more about overhead hoists is as important as keeping them properly maintained, so make sure to call in the right experts to help you keep your hoists in good shape.